BEIGE VINYL STRICTLY LIMITED TO 300 COPIES! It was the city of Belo Horizonte, Brazil that launched the ascent of their native sons in SEPULTURA (Portuguese for “grave”) in 1983 with a trajectory unsuspectingly aimed at the worldwide metal music scene. A band with humble economic beginnings whose musical identity was forged in the context of living through Brazil’s authoritarian military dictatorship, SEPULTURA would go on to become Brazilian ambassadors to the metal world, revered master architects of the death/thrash genre, and the most successful heavy metal band from the Federal Republic of Brazil. When SEPULTURA experienced a line-up change in the mid-1990s that was widely covered by the metal press around the world, remaining members recruited American Derrick Green in 1997 to front the band, a position the Cleveland, Ohio native has held for the past fifteen years and counting. This past June, long-time guitarist Andreas Kisser (who joined in1987), original bassist Paulo Jr., and drum prodigy Eloy Casagrande, SEPULTURA entered the studio in Venice, California with renowned producer Ross Robinson (KORN, MACHINE HEAD, FEAR FACTORY) - who also worked on the band’s landmark 1996 release, »Roots« - and co-producer Steve Evetts (THE DILLINGER ESCAPE PLAN, SYMPHONY X, INCANTATION) - who previously worked on SEPULTURA’s »Roorback« (2003), the »Revolusongs« EP (2002), and »Nation« (2001) – to record the band’s seventh studio album with Green (and their second album for Nuclear Blast): »The Mediator Between The Head And Hands Must Be The Heart«, scheduled for release this October. 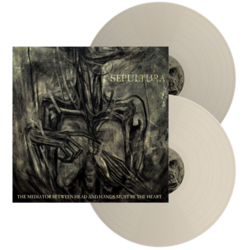 Inspired by Austrian filmmaker Fritz Lang’s classic 1927 movie “Metropolis,” SEPULTURA leans heavily on the strength of their thrash metal influences to make a statement against the dehumanizing effects of technology. Guitarist Andreas Kisser delves a little deeper: “In the movie, a crazy millionaire wants to transform a robot into a real person. That’s kind of the opposite of what we live today. More than ever, we are robotized through the worldwide web, Google glasses, chips under our skins and globalized slavery our society suffers nowadays. Being that the novel was written in the early 1920s, it’s almost prophetical. The phrase that inspired me - the main message of the story - points to the heart as being the human factor that keeps a man a man – not a robot. The heart beats with freedom of choice. We have to think for ourselves to create a real world, not a matrix.” Exploring the miseries and privileges associated with technological power, »The Mediator Between The Head And Hands Must Be The Heart« - SEPULTURA’s angry dystopian documentary in sonic form - also addresses the chaotic aftermath of natural disasters, the unfulfilled promises of religion, and the still-widening divide & unbridgeable gap between pampered citizens who live in decadent luxury and the working poor who withstand unbearable living & working conditions to simply survive. The album’s opening track, ‘Trauma Of War’, begins as a cacophony of noise that gives rise to an urgent panic that spins into a paranoiac distress about others making decisions that will lead to our demise in war. In ‘The Vatican’, we listen as yearning souls pray to their god to alleviate their suffering as the furious vocals, guitars, and drums document the moment when the faithful come face-to-face with the reality of their absent god too self-absorbed with being adored to notice humanity’s cries for help. ‘The Bliss Of Ignorants’ is an indictment by those who intimately know the depths of human suffering against those who don’t wish to know. ‘Grief’ weeps with its gnosis of such a feared emotion. With so many recent natural disasters throughout the world, who could deny the truth behind human greed & corruption sung about in ‘Manipulation Of Tragedy’? With both the 2014 FIFA World Cup championship and the 2016 Olympic Games headed to Rio de Janeiro, Brazil, a worldwide audience will surely be mesmerized by the glamour surrounding these world-broadcasted events. But there are those who bear witness to what won’t be televised; there are those who have seen the decades of daily strife of Brazilian citizens with wide-open eyes. »The Mediator Between The Head And Hands Must Be The Heart« never lacks confidence in what SEPULTURA knows: “I live in São Paulo, one of the big metropolises in the world with more than 20 million people living and working in it,” asserts Kisser. “I know how it is to live in daily chaos. Our music reflects a lot of that feeling.” Featuring a guest appearance by former SLAYER drummer Dave Lombardo, »The Mediator Between The Head And Hands Must Be The Heart« does what many great albums do: it captures a moment in time and carves out a place to have a dialogue with listeners with an honesty that rings so true, it becomes a part of our arsenal with which to defend ourselves against the wrongdoings of the world.